A good snack when I'm home working. 1. 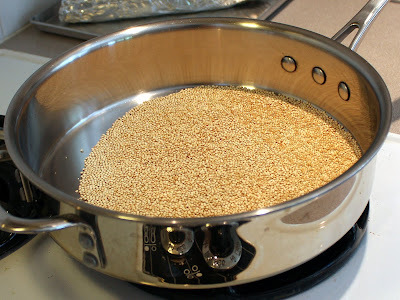 Pour 1/4 cup dry quinoa into a dry pan. 3. Transfer to a small pot that has about 3/4 cup water simmering. 4. Simmer slightly uncovered (leave lid askew about 1/4 inch to allow steam to escape) for 10 minutes. 5. Cover and let sit for 5 minutes. Fluff. Use more or less water depending on how mushy you like the final product. The quinoa is done when you can no longer see a small opaque center in the grain. I sprinkle this with tamari or just salt and toasted sesame seeds. Fluff! That's the step I've been missing.